If there is any place in the world that I want to see, if I want to go badly enough, I can make it happen! 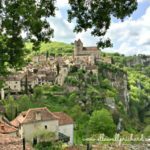 Last month I checked a driving trip through the Dordogne, Vézère and Lot river valleys of southwestern France off the top of my bucket list—a trip Lev and I first planned in 1990 and one I thought I would never make after his death. I was always the route planner and navigator on our driving trips, never the driver. As a widow, I found long-distance driving, even within Texas, stressful and tiring. I came to grips with the new reality that if I wanted to visit the national parks of the West or the Dakotas, Iowa and Minnesota—the four states I have never been in—I would have to sign up for a bus tour. 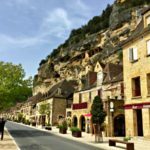 Most of my friends have never heard of the Dordogne region—referred to as Perigord in France—and they wanted to know where it is, how I knew about it and what I wanted to see there. 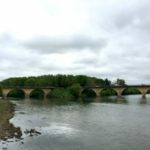 My route took me from Bordeaux to Sarlat-la-Canéda through Perigueux, with excursions as far as Rocamadour to the east and Cahors to the south, returning to Bordeaux along the Dordogne River, with a stop in Bergerac. The romantic association with Eleanor of Aquitaine and Richard the Lionhearted in the 12th century; this was part of their kingdom. I met Lev on a blind date a few days after he returned from his first trip to Europe. He had driven in Germany and Italy and then up to Paris. He fell in love with France—I was already in love, thanks to my hometown New Orleans and Bob Reid/Ralph Lynn history classes at Baylor—and we knew from the beginning of our marriage that we wanted to build a French house filled with French furniture. We started planning our first driving trip across Europe in 1968, after we bought a lot on which to build someday; and in September 1969 we drove from Lisbon up the Atlantic coast before crossing the mountains to Madrid, then straight south to the Moorish cities of Seville and Granada before driving the Mediterranean coast all the way to Avignon, France. From there we headed to the chateaux country of the Loire River before ending our trip in Paris. My planning guides were Baedecker, Michelin and a little book titled Olson’s Complete Motoring Guide to France, Switzerland, Italy. Olson offered four different itineraries for entering France from Spain and driving to Paris. 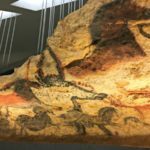 Itinerary #3 suggested a detour from Perigueux to Lascaux; Les Eyzies, site of the prehistoric museum; Sarlat, where I stayed 49 years later; and Rocamadour. Though we opted for a different route then, Olson’s book exposed us to all the different possibilities of driving through France. 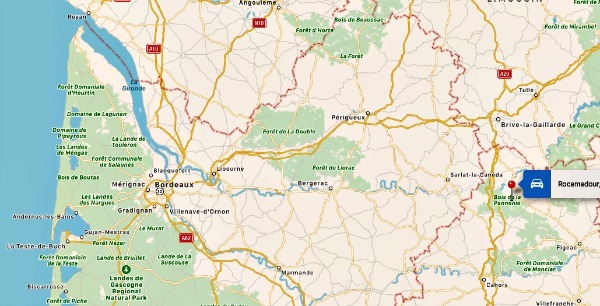 In a half-dozen or more trips that followed, we drove most of France, missing only this small piece of the southwest and the area to the northeast bordering Belgium, Germany and Switzerland. After Lev’s death, a friend recommended that I join Indagare, a travel club based in New York City, which for an annual fee books hotels and plans trips around the world for independent travelers. I began to depend on Indagare for planning a few days for me alone in foreign cities at the beginning or end of group tours. Four years ago, I realized that Maastricht, Netherlands, home of The European Fine Arts Fair, where I had an upcoming trip scheduled, was a short distance from major World War I battle sites in France and Reims, capital of the champagne district, where French kings were crowned in a medieval cathedral bombed in World War I and where the European armistice to end World War II was signed—another trip Lev and I planned but never made. Indagare took care of every detail of my three-day extension, with a chateau hotel, drivers, guides and dinner reservations. I checked a section of northeast France off my bucket list and realized, If there is any place in the world that I want to see, if I want to go badly enough, I can make it happen! That’s when I realized I could finally take the driving tour of the Dordogne that Lev and I had dreamed of for so many years. If your idea of foreign solo travel is to fly into a major city with a backpack and a Eurail pass and a vague idea of where you want to stay and what you want to see, that is very far from what I did. 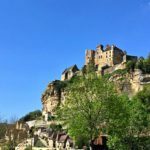 I contacted Indagare last winter and said I had 11 free days in April to go someplace in England or France, familiar countries with nonstop flights from DFW; and both the English Lake District and the Dordogne were high on my bucket list. 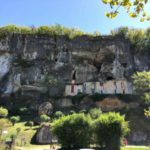 I soon discovered that northern England is cold and wet in April, so I settled on the Dordogne, asking only for three days in Bordeaux, followed by five or six days in the country, centrally located to visit both Lascaux and Rocamadour. They took it from there, booking my flights through Madrid and planning my itinerary. They booked my hotels, dinner reservations, drivers, guides and transfers; and I had 24×7 hot-line numbers in both Bordeaux and New York. 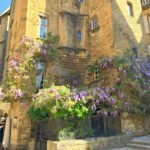 I had one-and-a-half free days both in Bordeaux and the medieval village of Sarlat. The rest of the time I was with a driver or guide.Hardly solo. Spending so much time alone in a car with a driver/guide. Would it be uncomfortable and awkward? My bad knee. What if it went out on me? Only my bum knee caused a problem, thanks to a seven-mile, four-hour walking tour in Bordeaux at the beginning of the trip. But I had packed a cane, knee brace and lots of Advil; and I was okay after one day of rest. In fact, the bum knee probably contributed to my good experience with my young driver/guide. When Johan picked me up for the drive to Sarlat, he asked if I wanted to sit in the front or back seat. Normally I would have ridden in the back seat, but I needed the extra leg room. What a difference that made! In our many hours in the car in the course of five days, we talked about all those forbidden topics like religion and politics, comparing our countries and our own worldviews and beliefs. He was personable and knowledgeable, and he spoke excellent English. 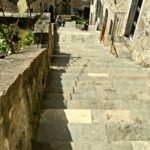 When I grew tired from all the steps and hills I climbed, he drove me from one medieval village to another, taking one-lane roads high up in the hills to show me another abandoned stone farmhouse, fortified castle or view of a wide river lined with trees. It was a fabulous experience. Dining alone is not a new experience for me, but I generally have dinner with family or friends several nights a week. Eleven solo dinners in a row is a lot. Fortunately, I can read a French menu and speak a few words in the language. Dining in the Dordogne turned out to be another of the great experiences of the trip. 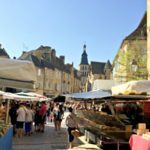 This area is famous for foie gras, ducks, geese, truffles, wild mushrooms, walnuts, strawberries and decent regional wines from Bergerac; and even the most modest sidewalk cafés served two-course Perigord dinners with foie gras. My goal was to eat foie gras every day. I had it seared on top of both tagiatelle pasta with truffle sauce and creamy, rich risotto. 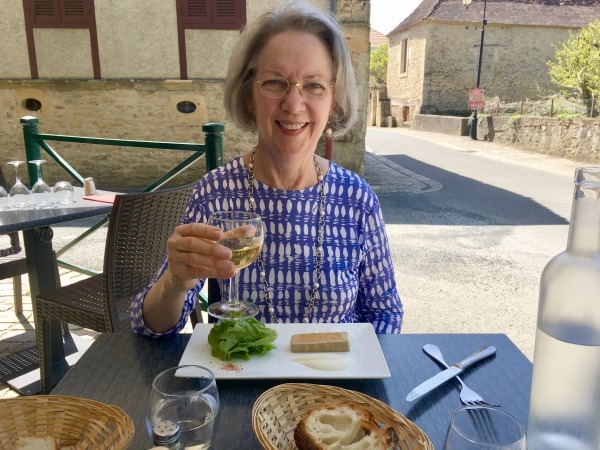 I also enjoyed foie gras—along with filet, salad and fresh strawberries and cream—in the walled garden of a 15th-c. chateau, located on a steep, narrow, crooked lane behind the ancient cathedral. Almost always I ate outside, in a casual setting surrounded by medieval buildings. There was so much to see as well as to eat, so many interesting people to watch, all the scents of the food and flowers, that I simply soaked in the sensory experience. I never felt uncomfortable or awkward, and I was never bored or lonely. My timing was perfect. I arrived on about the second day of warm spring weather, trees literally leafed out overnight and fruit trees and wisteria vines burst into bloom. In the countryside, whole fields were covered with bright yellow rapeseed. There was so much more history than I knew, from Roman ruins in Bordeaux and Perigueux to the fortified villages on top of almost every hill on both sides of the Dordogne River, the medieval boundary between France and England.This remote area was the site of the Hundred Years War and the Religious Wars between Catholics and Huguenots and the center of the French Resistance in World War II. The region has so much more scenic beauty than I expected—imagine an ancient, more dramatic, green, lush Texas Hill Country. 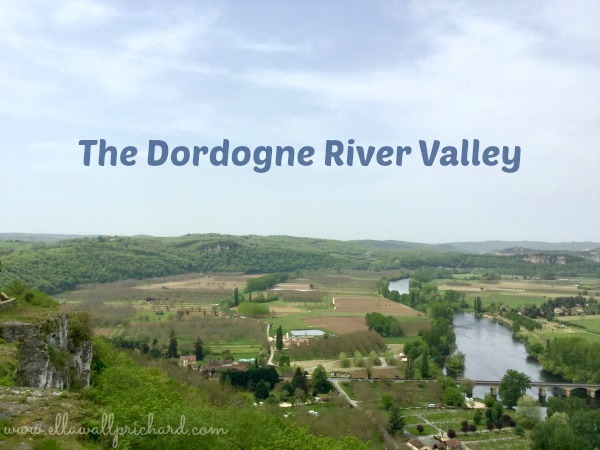 The limestone hills of the Dordogne were etched out by melting glaciers in the Ice Age. Villages, castles, even churches climb the walls of the steep cliffs where prehistoric people once lived. Wider valleys are fertile green farmland. Forests of oaks, chestnuts and walnuts cover the hills. Tourists canoe and kayak down the wide, lazy rivers. The price is right. I was shocked by how inexpensive everything was. 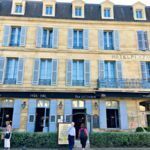 My hotel right in the center of the historic village of Sarlat, with full English breakfast, was €151. Decent two-course traditional Perigord meals at the sidewalk cafés were available for under €20, and a glass of wine was usually €4-5. My most expensive meal—four courses plus a half-bottle of their best regional red wine at the 15th-c. chateau—was €62. It would be $200 in Dallas.And there was no tipping. I have written far too much, and I haven’t even provided practical travel recommendations. 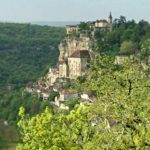 Are you interested in exploring the Dordogne? Maybe next week. If you want to see the day-to-day details of my trip, with photos, check my recent posts on Facebook and Instagram. 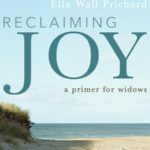 Ella’s memoir of her journey from grief, RECLAIMING JOY: A PRIMER FOR WIDOWS, will be released September 15. You may preorder now from the Baylor University Press or Amazon.